Add rustic charm to your home with this collection of dining and occasional furniture. Expertly crafted from veneers and hardwood solids, select pieces also feature natural finished metal bases. 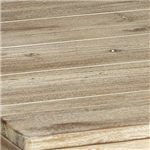 Rough-sawn plank style tops have a light beach color finish that brings a warm feel to any room. X-shaped silhouettes are featured throughout the collection on chair backs and table bases for a cohesive design. Complete your casual, rustic home with this beautiful collection. 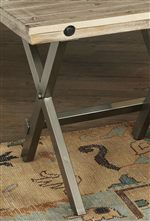 Browse other items in the Callista collection from Bullard Furniture in the Fayetteville, NC area.